The incredible bond between two addicts who form a friendship beyond the walls of their detox center. Martina feels trapped in a boxed life in Mexico City. Finding out about her pregnancy and not knowing what to do about it,, she decides to go to Berlin to search for the father, and starts a trip where she will find her own identity. 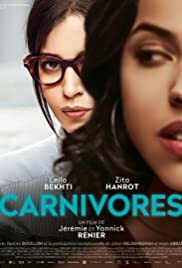 Although the initial synopsis sounded intresting on a psychological level, the movie very quickly showed lack of character depth and back-up stories as well as stereotypes : the two main sister characters are just very caricatural in their exhuberant&successful VS introvert&envious dynamic. There are huge narrative ellipses that make it quite hard to give credit to the development of the storyline. And last but not least, this movie borrows a great deal from "Always Shine", a 2016 movie directed by Sophia Takal and starring Caitlin Fitzgerald. So it definitely feels like a "deja vu".